Medications taken for a variety of diseases and symptoms can also interfere with one’s ability to manage hotter weather. These medications include antipsychotic drugs commonly given to Alzheimer’s patients to control agitation, anticholinergic drugs, tranquilizers, sedatives (including over-the-counter sleeping pills), amphetamines, diuretics and drugs to control blood pressure, antihistamines, and some antidepressants. Caregivers can prevent a heat-related emergency (hyperthermia) by keeping a loved one cool, watching for signs of heat stress and following these tips for dealing with hot weather. Wear cool clothing: See that the person is dressed in light-weight, light-colored, loose-fitting clothing, preferably of natural fabrics like cotton. Use hats and umbrellas outside. If the air conditioning appears to bother the person, offer layers, such as a long-sleeved shirt or sweater over the shoulders, or a light cloth over the ankles. Use air conditioning: Keep the air conditioning on below 80 degrees F. If you don’t have air conditioning, invest in a room air conditioner or use room fans to circulate inside air. If possible, drive the person a short distance to an air-conditioned place where they can sit, such as a library, mall, restaurant or theater. But avoid overcrowded places and rush hours. Avoid direct sun: Stay indoors during the hottest hours, 11 a.m. to 4 p.m. Drive as close to the door of destinations as possible, but don’t leave the person in the car where temperatures can soar quickly. If the person wants to be outside, make sure it’s during cooler hours and that he or she is in the shade, on a covered porch, or under an umbrella. Also check the news for information about temperatures, humidity levels and air pollution alerts. Eliminate or limit physical activity: If the person’s physician approves light exercise such as walking and movement exercises, limit them to short periods during cool hours. Eliminate entirely on very hot days. Drink plenty of fluids: Give the person plenty of water and fruit or vegetable juice even if they say they’re not thirsty. No alcohol, coffee or tea. Seek medical help if you suspect dehydration. Light meals: Avoid hot, heavy meals and don’t use the oven. Monitor medications: Find out if the person’s medications increase his or her risk for heat stress. Be sure to ask a physician about all the medications being taken, including off-the-shelf items. Take cool showers: Help the person take a cooling shower or bath. Lay a cool, moistened towel over the forehead or back of the neck and replace often. Check in often: If the person lives alone, check in daily or ask a neighbor to look in several times a day. If the person lacks transportation, make sure someone takes him or her to and from appointments, grocery stores, etc. Inform others: If the person is in a nursing home or other facility, make sure the facility has a plan for dealing with rising temperatures and is following the tips mentioned above. Visit as often as possible. Be alert: Remember that a cognitively-impaired person may not be able to tell you when he or she is feeling hot or ill. Also, older people tend to feel colder than younger people so they may not sense the danger of hotter weather. If you are caring for an elderly or disabled person, learn the signs of heat-related problems. Seek medical assistance for any of the following signs and — if you suspect heat stroke — call 911 or medical personnel immediately. Headache, nausea and fatigue are signs of at least some heat stress. Heat fatigue: cool, moist skin, a weakened pulse, feeling faint. Heat syncope: sudden dizziness, pale, sweaty looking skin that is moist and cool to the touch, weakened pulse and rapid heart rate but normal body temperature (that is, 98.6 degrees, taken with a thermometer). 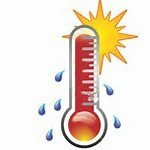 Heat exhaustion: this is warning that the body is getting too hot. Watch for thirst, giddiness, weakness, lack of coordination, nausea, and profuse sweating. Cold, clammy skin. Body temperature may be normal (98.6 degrees). Pulse is normal or raised slightly. Pupils may contract. Urination decreases and the person may vomit. Heat stroke: this is life-threatening. Immediate medical attention is required. Death can occur quickly when heat stroke occurs. Body temperature rises above 100 degrees F (some sources say 104 degrees F), and the person may become confused, combative, behave bizarrely, feel faint, stagger. Pulse is rapid. Skin is dry, flushed and may feel hot. Lack of sweating. Breathing may be fast and shallow. Pupils may widen or dilate. Delirium, seizures or convulsions, and coma are possible. Have the person lie down in a cool place. Apply cool, wet cloths or water to the skin, especially the head, groin and armpits which cool quickly. Fan by hand or with an electric fan. And remember — if you suspect heat stroke, call 911 or summon medical personnel immediately. Fortunately, the heat will subside shortly, but let’s all exercise extra precaution during this challenging time! Thanks, the Hired Hands Marin senior care team.